Kevin Breel is a writer and comedian. He is also a mental health activist and has written about his experience with depression as a teen in his book, Boy Meets Depression. On the show today - Painfully Funny, ideas about how humor can help us cope with things that on their face aren't very funny. KEVIN BREEL: This is my first time in Massachusetts. Can you believe that? RAZ: This is Kevin Breel, as you guessed it, a writer and a standup comedian. BREEL: I like how we have a few reserved seats that aren't taken. That's awesome. BREEL: Doesn't exactly make sense but that's OK. We can do that. She's got a blanket. She's ready for a camp out. BREEL: I'm not sure how this event was marketed. RAZ: So obviously being funny is what Kevin does for a living. But being funny is also a way he deals with life. BREEL: Humor I think is either kind of like an invitation or a shield. Like, you can use humor to keep people on the outside of your life. And that's what I did as a young person when I was really struggling. I never wanted anyone to see what was going on. And so my defense mechanism was humor. BREEL: But I also think that humor can be this invitation into ideas and thoughts and stories that might otherwise be too uncomfortable and heavy because there's no sort of redemptive narrative within them. RAZ: For Kevin, humor was a way to deal with his depression. But at least in the beginning, it was more of a shield than an invitation. BREEL: When I was 13 years old, my best friend at the time named Jordan McGregor passed away in a car accident. And it was an experience that really radically changed my life. And when he died, it just ripped everything out of me and felt like I was shattered in just a million different pieces. I mean, it's a kind of grief that to this day I kind of really struggle to put accurate words and language around it because it was just so overwhelming. But that was my first experience with this really intense feeling of grief and loss and depression. And then from 13 to 17, I kind of fluctuated in and out of these what I might call seasons of depression, where it just felt like it would come in waves. And, you know, for a month to three months, I would be in this really dark, hopeless place. BREEL: But I was fighting that secretly in a lot ways. BREEL: I didn't want people to see that. And I didn't think it was OK to talk about it. And so that became this extra weight of, you know, shame and embarrassment and guilt. 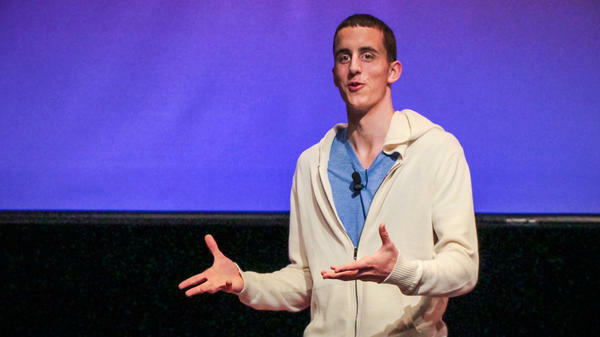 BREEL: Here's how Kevin Breel tells his story on the TED stage. And if you couldn't already tell, this story is going to sound pretty different from the other ones you've heard on the show. BREEL: For a long time in my life, I felt like I'd been living two different lives. There's the life that everyone sees. And then there's the life that only I see. And in the life that everyone sees, who I am is a friend, a son, a brother, a standup comedian and a teenager. In the life that only I see, who I am, who I really am is someone who struggles intensely with depression. I have for the last six years of my life. And I continue to every day. BREEL: You feel like you're wearing this mask every day, you know. And you're sort of trying to maybe play this character or something of what you think normal looks like. BREEL: And so for me, my approach to it was I used my humor and my sort of personality to really take the first step in seeming normal, like, my idea, I guess, of what normal was at that time. I'm not even sure there is such a thing now. But at the time, I was pretty convinced that there was a certain way to act. And so I was super outgoing, easy to talk to, someone who was really, you know, inclined to make jokes. And it was really just this continual way of almost saying to myself, I'm OK. I'm all right. You know? And it was almost this way of trying to convince myself that things weren't as desperate as they really were. And then I would go into my room late at night. And I would have thoughts of, you know, ending my life. BREEL: So I sat there that night beside a bottle of pills with a pen and paper in my hand. And I thought about taking my own life. And I came this close to doing it. I came this close to doing it. And I didn't. So that makes me one of the lucky ones, one of the people who gets to step out on the ledge and look down but not jump, one of the lucky ones who survives. Well, I survived. And that just leaves me with my story. And my story is this in four simple words - I suffer from depression. Unfortunately, we live in a world where if you break your arm, everyone runs over to sign your cast. But if you tell people you're depressed, everyone runs the other way. That's the stigma. RAZ: In the meantime, as you were experiencing some of this, you were trying to, like, launch your career as a standup comic. BREEL: Yeah, in the absolute mecca of show business in Victoria, B.C., Canada. Yeah, totally. RAZ: Yeah. So while, like, while struggling with crippling depression, you were trying to be funny to, like, people in comedy houses. BREEL: Oh, gosh, yeah, I know. It's just so cliche in so many ways, but yeah. Yeah, no, exactly. I - you know, look, I think this is part of it, too - right? - is there's this big idea that kind of says, you know, everyone in - who does comedy or anyone who's a comedian is this sort of sad clown. And, you know, they have all these issues and, you know. And sometimes I do feel a little bit stereotypical kind of living in to that idea. But for me, you just got to think about it this way, which is that when I was really recovering, during that time, my constant sense of feeling better was watching comedy. I was obsessed. RAZ: Are you are you comfortable, like, joking about depression and mental illness, or is there like a - do you, like, draw a line at it? BREEL: I'm - it's difficult because I would never want to make a joke that would seem as though it's demeaning those experiences. But one of the most interesting things is we kind of put up these walls in our mind around certain topics, right? And we go we can't laugh at that. That's not funny. And when you're saying that, what are you really saying? Like, that's too serious to laugh at. That's too important to laugh at. And I really thought about that question for a long time and then realized but that's one of the best ways into these conversations. BREEL: We all know what it is to hurt. We all know what it is to have pain in our heart, and we all know how important it is to heal. But right now, depression is society's deep cut that we're content to put a Band-Aid over and pretend it's not there. Well, it is there. It is there, and you know what? It's OK. Depression is OK. If you're going through it, know that you're OK. I know that you're sick. You're not weak. And it's an issue, not an identity, because when you get past the fear and the ridicule and the judgment and the stigma of others, you can see depression for what it really is. And that's just a part of life. RAZ: Yeah. I mean, it's almost like that pain is a source of material. Like, it's - it's like you have to have that pain to have something to be funny about. BREEL: Yeah. And I think - and my perspective on that would be not even just to have something to be funny about, to know why it even matters to be funny, to look at it past just, oh, that's, you know, a good laugh and to see what that really means to someone on a spiritual or emotional level. And I think that we live in this world now that is so serious in so many ways. And we're so plugged in to our technology and we're so plugged into these external realities that feel like they're constantly kind of knocking on the door of our mind and just begging for our attention. And to laugh is to find yourself back in the moment. To laugh is to be free in so many ways. And so for myself, that's just something that I think about all the time. And I try and bring into my work, is just that's what I'm really here to do. If I'm here to serve someone, that's the way I'm serving them, and that's what means the most to me. I had this moment when I was 17 years old - and I can remember this so clearly - where I was really asking myself this question of am I going to pursue this, you know? Is this going to be the path that I follow? And I one day thought - I went, what's the definition of laughter? BREEL: Like, I don't even know. And I went and I looked it up in the dictionary, and it said the definition of laughter is the tangible evidence of hope. And to me, that changed my whole life because I just went, yes. Like, that's what comedy gave me was this tangible sense of hope, this - not just an escape from my problems but this completely different reality in which I would be so overwhelmed with the present moment and with laughter that I couldn't even remember what this struggle that I was experiencing on the day to day was. And that changed everything for me. RAZ: Kevin Breel - he's a comedian and author of the book "Boy Meets Depression." You can see his entire talk at ted.com. LOUIS PRIMA: (Singing) When you're smiling. UNIDENTIFIED SINGERS: (Singing) When you're smiling. PRIMA: (Singing) When you're smiling. PRIMA: (Singing) And the whole world smiles with you. UNIDENTIFIED SINGERS: (Singing) Smiles with you. PRIMA: (Singing) And when you're laughing. UNIDENTIFIED SINGERS: (Singing) When you're laughing. PRIMA: (Singing) Oh, you're laughing. UNIDENTIFIED SINGERS: (Singing) Oh, you're laughing. PRIMA: (Singing) And the sun comes shining through. UNIDENTIFIED SINGERS: (Singing) Shining through. RAZ: Hey, thanks for listening to our show, Painfully Funny, this week. If you want to find out more about who was on it, go to ted.npr.org. To see hundreds more TED talks, check out ted.com or the TED app. Our production staff at NPR includes Jeff Rogers, Brent Baughman, Sanaz Meshkinpour, Jinae West, Rund Abdel Fattah (ph), Rachel Faulkner and Neva Grant, with help from Daniel Shukin. Our intern is Thomas Lu. Our partners at TED are Chris Anderson, Kelly Steotzel, Anna Phelan and Janet Lee. If you want to let us know what you think about the show, you can write us at tedradiohour@npr.org. You can also follow us on Twitter. It's @tedradiohour. Please subscribe to our podcast via iTunes or however you get your podcasts. And while you're there, please do write us a review. I'm Guy Raz, and you've been listening to ideas worth spreading right here on the TED Radio Hour from NPR. PRIMA: (Singing) When you're laughing you bring on the joy. UNIDENTIFIED SINGERS: (Singing) Bring on the joy. UNIDENTIFIED SINGERS: (Singing) Be happy. PRIMA: (Singing) You've got to groove, my boy. UNIDENTIFIED SINGERS: (Singing) You've got to groove, my boy. PRIMA: (Singing) Keep on smiling. UNIDENTIFIED SINGERS: (Singing) Keep on smiling. PRIMA: (Singing) And the whole world smiles with you. Transcript provided by NPR, Copyright NPR.